All legendary people in advertising and marketing. What a dream situation it would be to actually meet with those people and learn from their experiences and expertise. If only it were true. That was the last thing I expected when PebblePost decided to pay homage to those iconic leaders by naming our conference rooms after them. It all started when we outgrew our original space in New York. That office was in Cooper Square, a building that was operated in a trust from Max Stern. (Speaking of iconic leaders, Stern, one of the greatest entrepreneurs in American history, came over as a poor immigrant and founded the Hartz Mountain Products Corporation, the pet food giant.) The trust stipulated that the building was to be for entrepreneurial uses. A lot of my portfolio companies wound up there. Through a longtime investor and friend, Craig Lemle, we wound up getting a new space on Lafayette, next door to the Wanamaker Building. (Speaking of yet another iconic leader, the Wanamaker Building was named after department store pioneer John Wanamaker who invented the price tag — somebody had to — and allegedly said, “Half the money I spend on advertising is wasted; the trouble is, I don’t know which half.”) At any rate, we love our new space and we can probably expand up to 200+ people in the core of it. Next came all the details, large and small, including the question of whether we should name our conference rooms. A lot of companies do that, usually in a straightforward way involving landmarks. The room that’s on the same side as the Hudson River is called Hudson and so on. That can be useful because it lets people know their compass directions when they’re in the space. But I thought it would be more fun to name the rooms after leaders of advertising and marketing. We did the research and came up with a list of about 20 names. Some we will probably rotate but others will remain fixed because of their stature. Once it was time to bring furniture into our new space and get the IT guys started on setting everything up, I did what I always do at that stage of an important move. I’m not kidding. My last seven or eight moves? I was out of town for every one. Unless you absolutely have to be there for a big move — and trust me, your team will love you if you answer that question honestly — you’re better off making yourself scarce. Otherwise, you’ll just be in the way and out of sorts. I spent the duration of the move working out of our San Francisco office before heading to Napa Valley for the weekend. That’s where I was when the IT guys did their first test of the email invitation/calendar function for reserving conference rooms. Uh-oh. My inbox was flooded with 67 email notifications at once. When I pinged the IT guys, they realized when our assistant set up meetings, it would send to my account. Our assistant fixed it so that each conference room had its own dedicated account for reserving the room and sending out the invites. 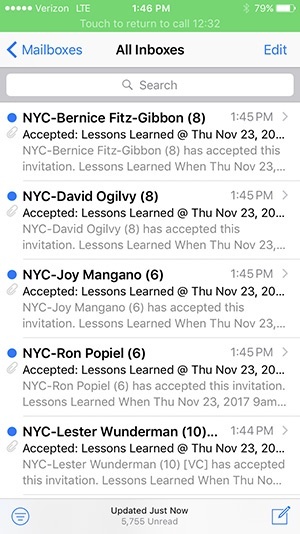 That’s why the next round of emails I got was titled “Lessons Learned,” seemingly sent from all those marketing legends. After getting an email in which Lester Wunderman seemingly invited me to meet with him and learn some lessons from his long and successful career in direct marketing, I actually did get to meet with Lester Wunderman for that purpose. 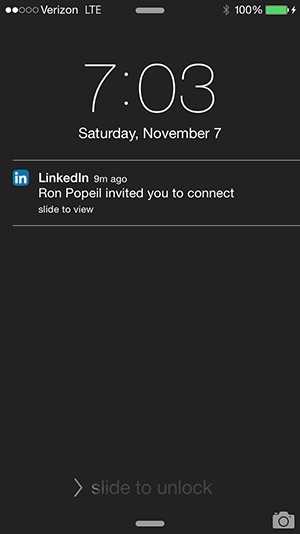 In perhaps the least plausible twist of all, I also ended up getting a LinkedIn request and trading voicemails with Ron Popeil of Pocket Fisherman and “Set it and forget it” fame. While all this is pretty funny, it’s not a joke. And it’s not a kitschy gimmick. A lot of our culture at PebblePost is about maintaining a solid foundation in the marketing principles that pioneers in our field established long before we came along. That’s why the plan goes beyond simply naming the conference rooms — we want to include photos of each room’s namesake along with their bios, quotes and examples of some of their famous products or campaigns. It’s important that our employees and our customers learn about them. Now, don’t get me wrong. I’ll match our programmatic capabilities and our technical team with those of any company in the industry. But sometimes the smartest thing you can do as you navigate our digital future is to seek guidance from the leaders of our analog past.